In my travels across New York City documenting street art and graffiti, I’m always excited when I stumble across full-blown illicit installations. While stenciling and wheatpasting continue to explode in popularity, it takes another level of commitment, chutzpah if you will, to pull off something more involved. 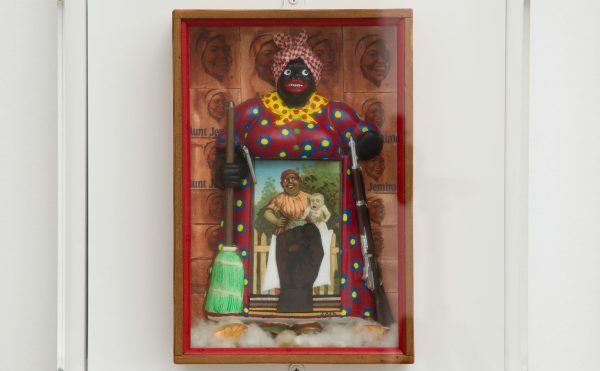 Using salvaged or re-appropriated materials, NYC street artists are both piggybacking their pieces onto existing street furniture and brazenly installing work of their own. 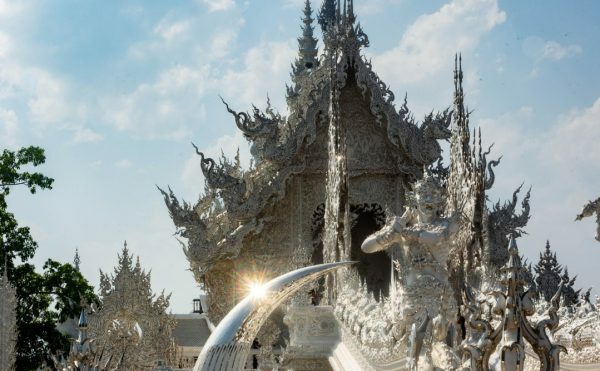 There are highly skilled carpenters and iron workers amongst the ranks of artists — the sole unifying factor in an otherwise diverse group is the placement of their work on the street. Some pieces last but a few hours, but you’d be surprised how many fly under the radar and run for years. 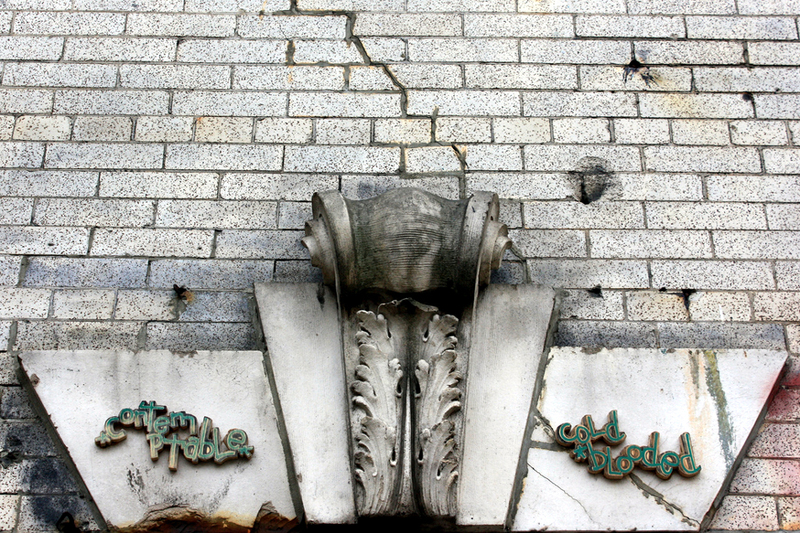 The following is a cross-section of some of New York City’s finest three-dimensional street art. 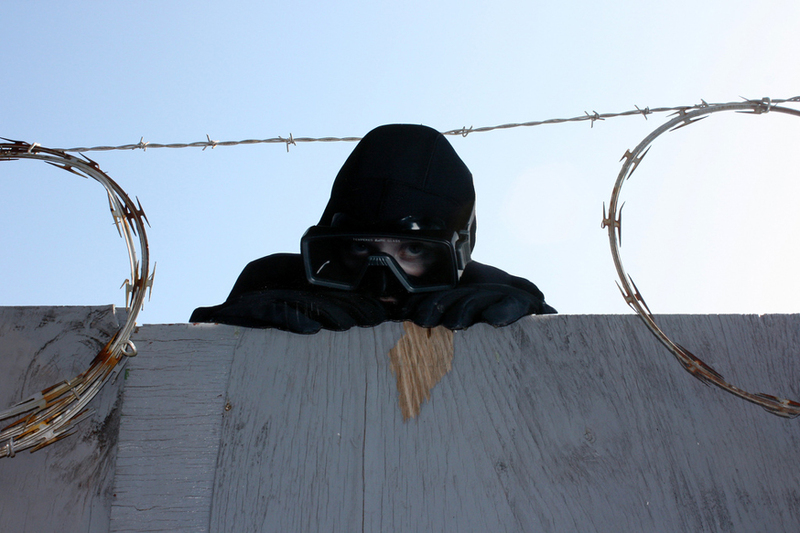 Dan Witz’ photorealistic diver peaks over the edge of a construction fence. 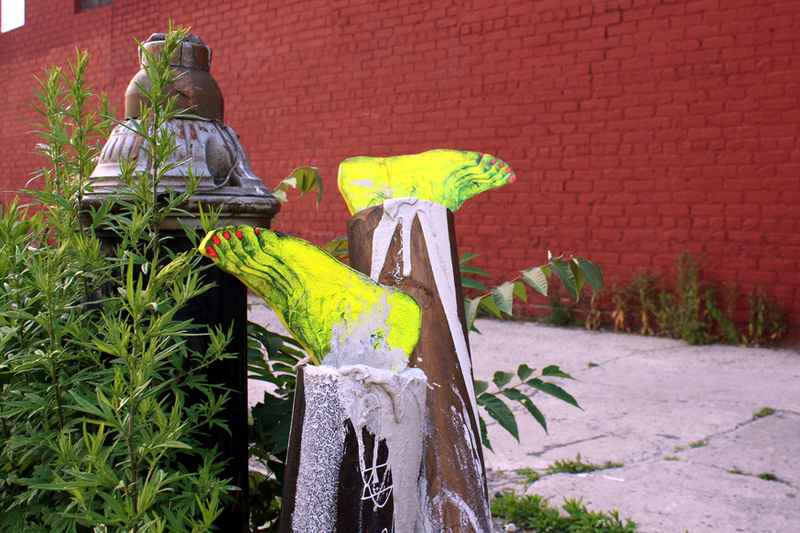 Judith Supine playfully adds some wooden feet to two metal pipes jutting out of a sidewalk. 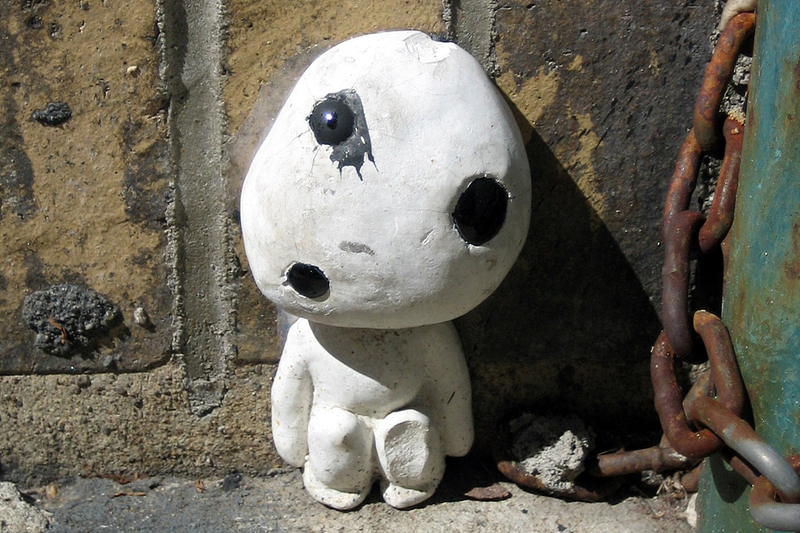 An unknown artists has sculpted a kodama, a spirit from Japanese folklore, out of clay. 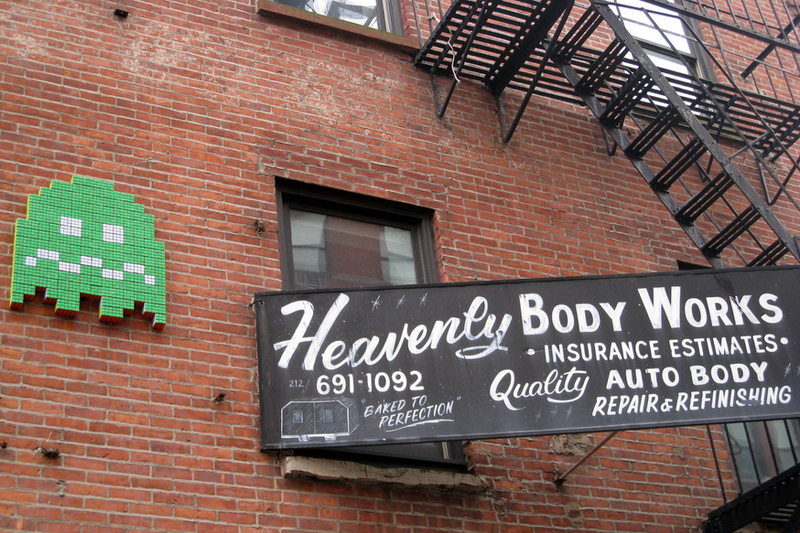 Generally known for his use of ceramic tiles, Space Invader builds a classic arcade ghost out of Rubik’s cubes. 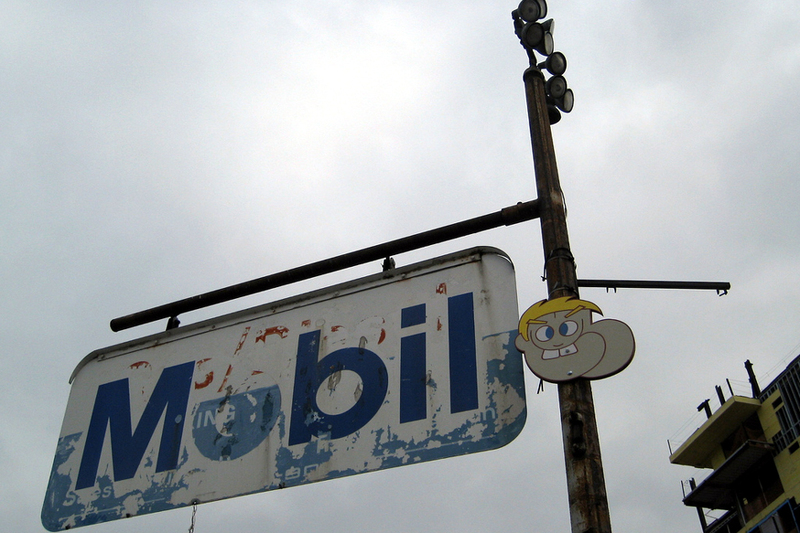 Moody often attaches his one-of-a-kind wooden characters to storefronts and signs. Using standard DOT street poles as anchors, Gore B installs numerous wooden boards all over the city. 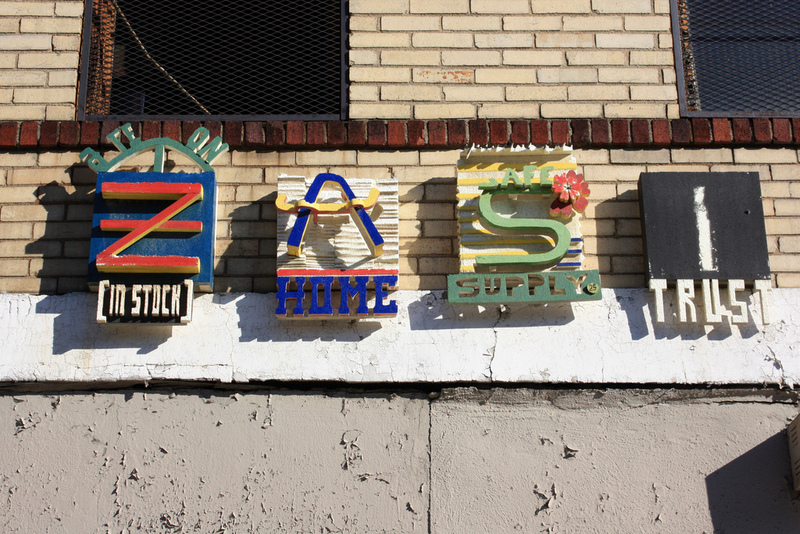 Deeker has a way with words — he cuts them out of wood and glues them in unlikely places. 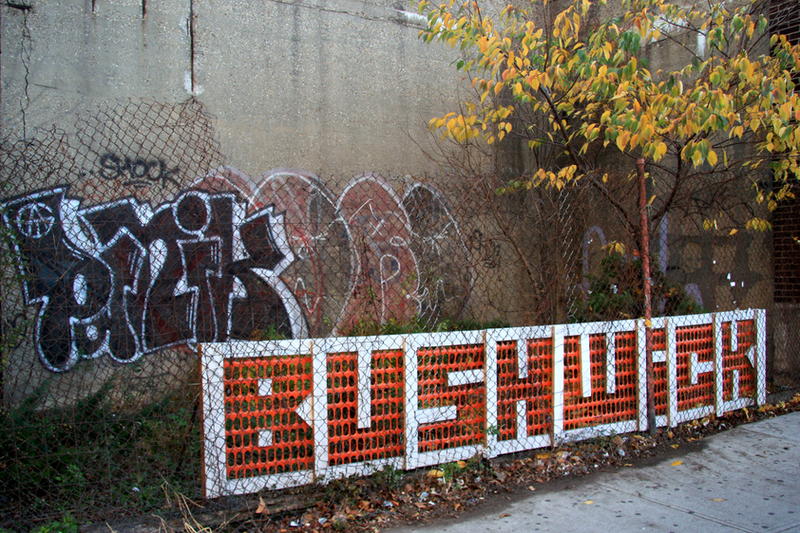 Skewville re-purposes found material to spell out the name of his neighborhood in his distinct font. 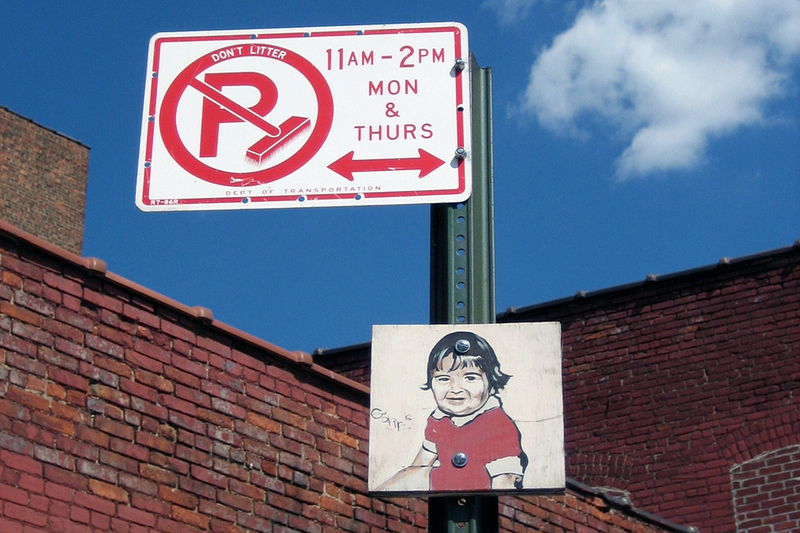 Although it has seen some wear, this installation by Zast still gives passersby a reason to pause and wonder. 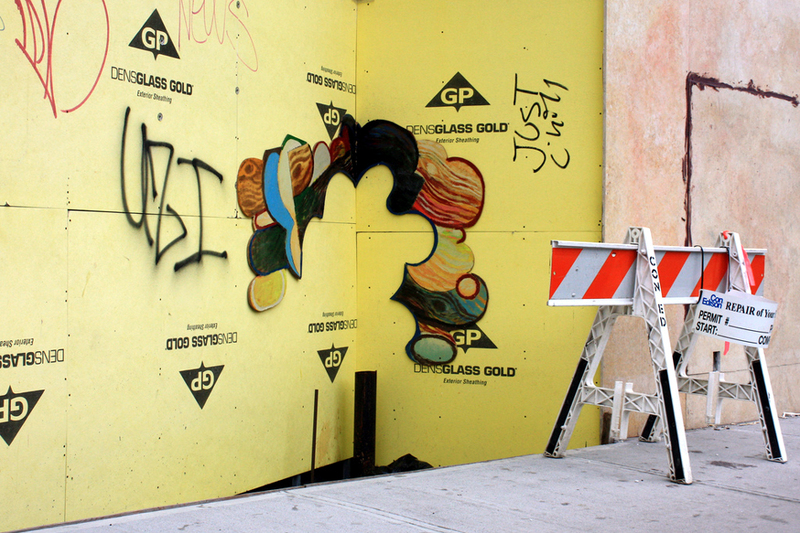 J-Bird attaches his painted wooden pieces to construction sites. 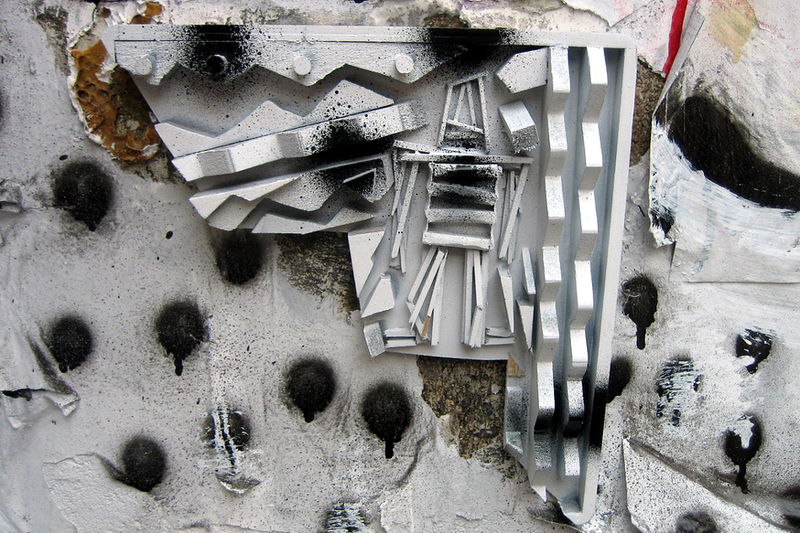 Although Stikman constantly reinvents his iconic figure, its form is still distinguishable under a coat of paint. 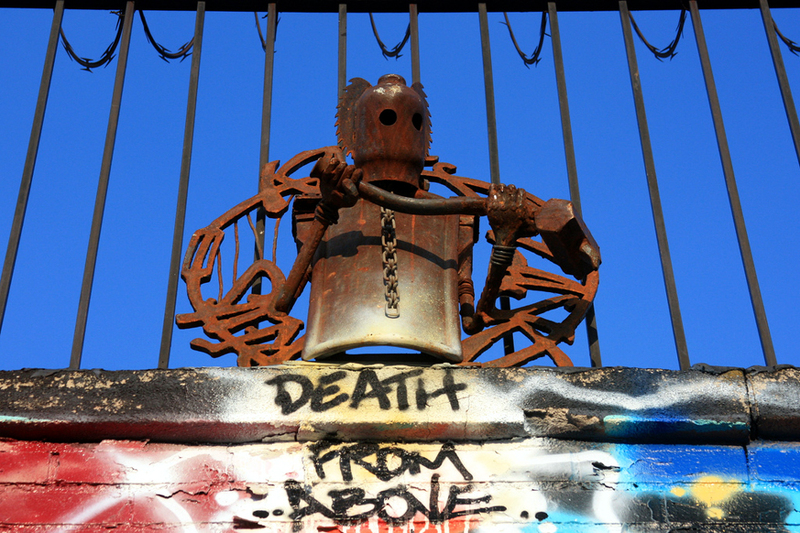 An iron worker by trade, Revs welds words … and dark, foreboding figures. 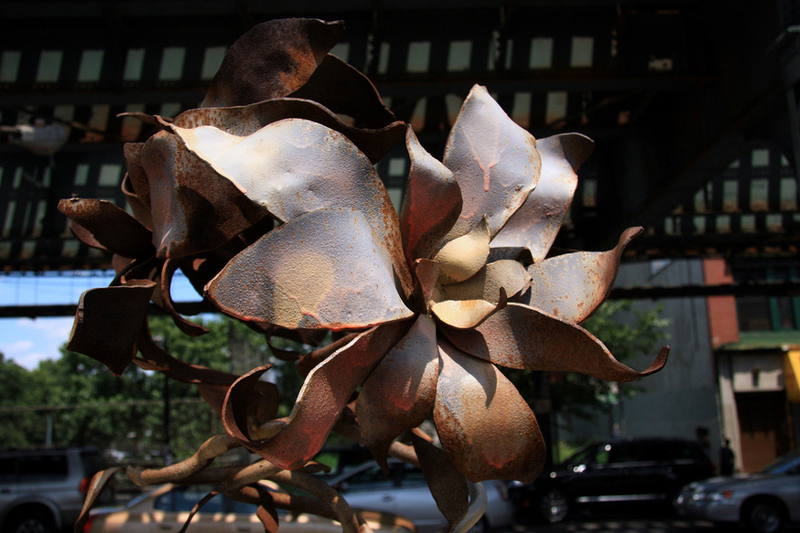 Under an elevated train, Darius Jones’ metal flower blooms eternally. 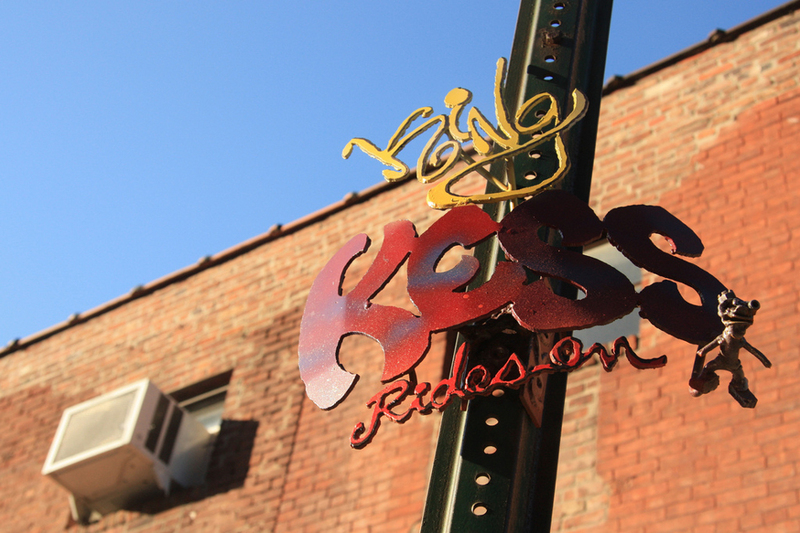 JJ Veronis honors his good friend Andy Kessler, a skateboard legend, who died too soon. 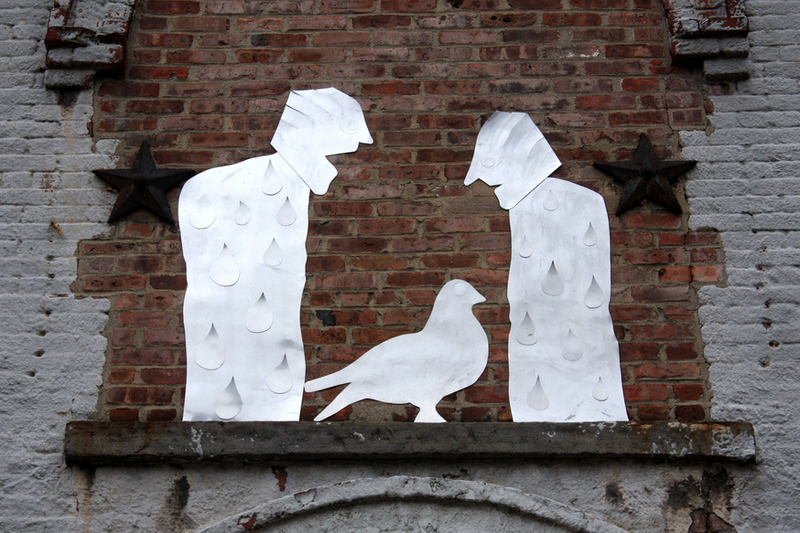 An unknown artist has installed two figures whimsically contemplating a bird. 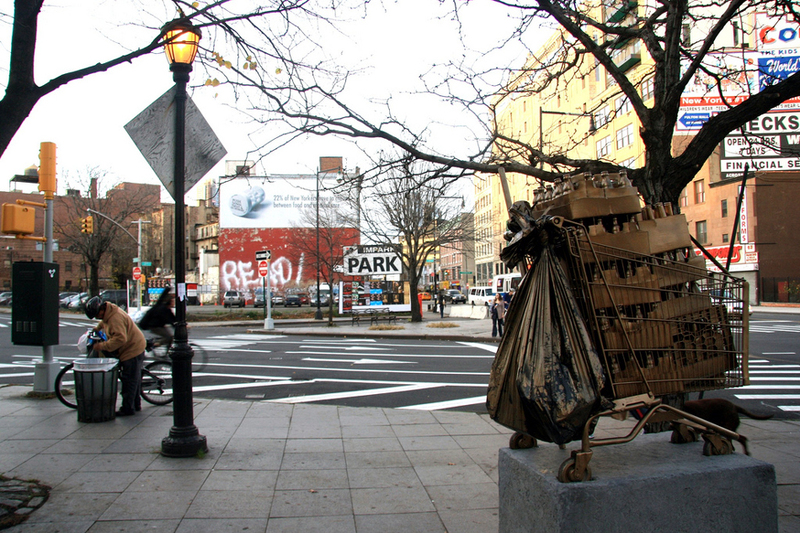 Specter’s gilded shopping cart full of empty bottles is a monument to the city’s unofficial recyclers.